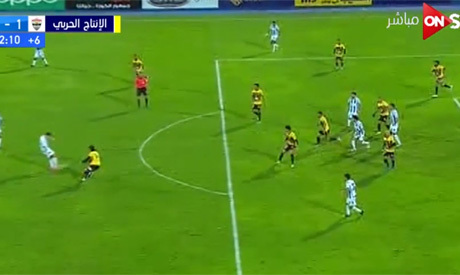 Pyramids FC were on the receiving end of an astonishing refereeing error as they stumbled again following a 1-1 draw with El-Entag El-Harby in the Egyptian Premier League on Tuesday. The hosts, who are hoping to push leaders Zamalek all the way in the title race, took the lead after 19 minutes, thanks to a penalty from playmaker Magdi Afsha. Nigerian forward James Owoboskini towered unmarked to head home a deep cross and bring El-Entag level five minutes before the break. Both sides wasted several clear-cut chances in an end-to-end second half but the highlight was a bizarre refereeing call in the dying stages. Nasser Mansi acrobatically fired home from close range after a shot was parried into his path but his celebration was cut short by the flag of the Tunisian linesman. Television replays showed that the forward was clearly played onside by an El-Entag defender. Pyramids also had a legitimate penalty claim waved away by the Tunisian official. Foreign officials are brought in to take charge of Pyramid's home matches upon the big-spending club's request. The Saudi-owned outfit drew for the second successive match as they failed to build on their remarkable 2-1 victory over holders Ahly earlier this month. They are now six points behind Zamalek, who can extend their advantage to 12 points if they win their two matches in hand.